After joining MTRA in the fall of 2014 as our Head Instructor at the Hillcrest School, then moving into the Program Director position in 2015, we were pleased to be able to promote Pam Morrison to the position of Executive Director in June 2018. 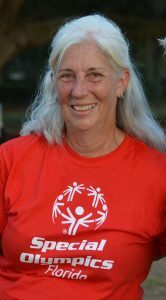 A PATH Certified Instructor, Pam received her certification in 2009 while working at Harmony Farms in Rockledge, Florida, where she later became Program Director. After five years with Harmony Farms, Pam moved to Hidden Acres in Port St. John to help with a new equine program focusing on at-risk youth, as well as conducting riding lessons for all levels of dressage, hunter/jumper, trail and obstacle challenges for beginner through intermediate riders. Her love for the horse and passion for equine-assisted therapeutic riding brought her to MTRA. Pam studied at the University of Southern Maine and held a career in general management in the country club industry. She served on the PATH International National Conference Committee in 2013 as a chair of hospitality and entertainment. Pam also served on the committee for the PATH Regional Conference in 2012, held in Tampa. Pam has huge shoes to fill with the departure of our much loved Leslie Gettys, who recently resigned to return to her home state of Alabama due to personal commitments. But we are certain that she will be able to make this transition smoothly and effectively and the Board of Directors looks forward to continuing a great working relationship with Pam at the helm.